Supplying a broad array of measurements (including Brightness, Color, Color Difference, Fluorescence, Opacity, Whiteness, Tint, and Effective Residual Ink Concentration), the innovative Color Touch spectrophotometer is the quickest, most accurate tool for measuring the optical properties of pulp and paper. With its touchscreen software, this system lets you measure and analyze key parameters in a variety of easy to use formats. With this machine, a pliable specimen is placed under a constant tension load. The specimen is then folded to an angle of 135° in either direction, at the rate of 175 double folds per minute until the specimen is severed at the crease. A variable folding rate option allows the operator to vary the folding rate between 20 and 175 double folds per minute. The new precision digital micrometer combines a modern contemporary look with a robust mechanical design and new improved electronics, including a digital linear encoder. The system features a comprehensive software program for controlling test speed, auto zero, auto sample detect, selectable opening distance, selectable measurement range, selectable dwell time, built-in auto sample feed option, statistics, multiple languages and calibration records. 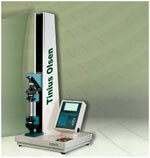 Designed for thickness measurements of sheet materials. Thickness gauge to determine the thickness of leather, textiles, cardboard, felt, rubber, sheet metal, foil, plywood, plastic, etc. Tear testing determines the force required to continue the tearing of an initial cut in sheet materials. 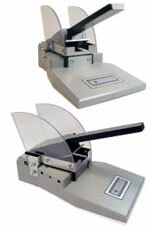 This is also used to evaluate strength of perforated materials such as postal reply cards. The Monitor/Tear™ is an automated tear tester equipped with an optical encoder, measuring the angular position of the pendulum during the tearing operation, and converting this measurement to tear units. 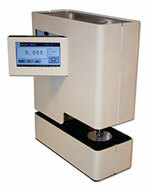 The Specimen Cutter has been designed to cut accurate samples for the Elmendorf Tear Tester. 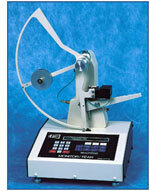 This triple shear cutter is very easy to use and produces 2.5 x 3.0 in. (63 x 76 mm) test pieces. Tear testing measures the force required to continue the tearing of an initial cut in sheet materials. 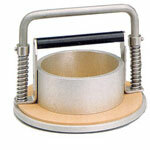 Models and weights are available to test material with a variety of strengths. This is also useful to evaluate strength of perforated materials. Also known as the Elmendorf test, the tearing test has been performed in the paper industry for more than half century in order to measure the mean internal resistance of cellulose or papers to the propagation of a deliberately initiated tear. It enables rapid determination of the dynamic resistance of materials designed to be subjected to strong shearing loads (e.g. newspaper) or liable to be damaged by sharp or heavy objects (e.g. paper bags, seat belts, protective clothing). Water absorptiveness (Cobb value) is the mass of water absorbed in a specific time by a 1 sq. 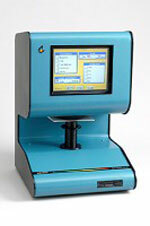 meter sample of paper, board or corrugated under conditions specified in standards such as TAPPI T 441. Cobb sizing testers provide a simple, standardized method for fast determination of the quantity of water absorbed by a paper or board in a given time.